The Pines is beautiful both outside and inside..the perfect spot to relax and unwind! We went to St. Michaels for the spring half marathon and rented Pines at Barrett Cove. We had a great stay. The house is well set up for couples - very open on the inside and the kitchen is large and well equipped (maybe the best equipped of any rental I have stayed in). The grounds are expansive and beautiful, and the pool is a big bonus. A wonderful house, and we will be back. Everyone loved the house, great location.Lots of birds to watch. My daughter loved the hot tub and the pool came in handy to practice her paddle board skills. Everything was there that I needed. The washing machine was a bit noisy. very clean and great sunrises! Great home with spacious living areas, and great location. Best equipped kitchen we've ever seen in a vacation rental! Excellent hot tub and deck area as well. I have been coming to the Bay for over thirty 30 and the "Pines at Barrett's Cove" is outstanding. For the price,location and aesthics, nothing compares to this rental from Rock Hall down to Cambridge. My family had a wonderful 5 day vacation at the Pines at Barrett Cove. The house exceeded expectations in every way. We had 5 adults and 2 dogs staying at the house and we never felt cramped. There were plenty of sitting areas throughout the property where we could all come together or get away. The kitchen was well equipped with the essentials that were in good condition. The knives were sharp, the spatulas were not melted, and the toaster, stove, and microwave all worked perfectly! The towels and linens were clean and fresh, and the furniture was comfortable to sit on. There were 3 crab traps on the dock that we took full use of everyday. The kitchen had everything we needed to have a crab dinner every night. The kayaks were in like new condition, the pool was beautiful, and the hot tub was perfect. I have stayed at many rental homes, and have learned to bring an abundance of household items because things like the toaster or coffee makers are cheap and work poorly. This is not the case at Barrett Cove. Save yourself the burden of over packing and only include salt and pepper, and a large coffee cup. Thank You Pines at Barrett Cove for a perfect stay! Second year here. Very enjoyable. A most comfortable home. Peaceful & serene. Great pool. Just some minor issues: cushions on some of the wicker chairs & loveseat have little or no padding. Need light blocking curtains in master bedroom ( spotlight on adjacent cottage on all night shone thru window,making sleep difficult. Needed dustpan, couldn't find one. All in all, a great place. We'll be back ! We recently stayed for 7 nights at the Pines at Barrett Cove and cannot say enough good things about this property. This is our second stay with Eastern Shore Vacation Rentals and second time in St. Michaels this year, once in the winter and most recently at Pines. The house was exactly as advertised and we could not have been more pleased. 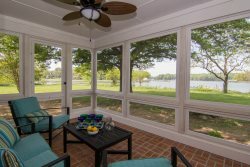 The property and pool were well kept, the kitchen is well equipped and great for cooking and still being part of the conversation in the sunroom. We caught lots of crabs from the dock and enjoyed them several nights during our stay. St. Michaels is a short drive and we enjoyed late afternoon shopping, picking up shrimp at Big Al's and pizza from Ava's on more than one occasion.We will definitely be booking a week next summer very soon.I should not forget to mention the staff at ESVR. The trash had not been collected (not a big deal) when we arrived and when I called there was someone there within a few hours to haul it away. These folks are professional and certainly want you to enjoy your time in St. Michaels. THE PINES @ BARRETTS COVE WAS A VERY QUIET, RELAXING VACATION FOR OUR FAMILY. WE BROUGHT ALONG OUR LITTLE JOHN BOAT AND THE GUYS WENT CRABBING EVERYDAY AS WELL AS OFF THE PIER. THE POOL WAS VERY REFRESHING AND "THE MONSTER" IN THE POOL KEPT THE WATER SPARKLING. OUR YELLOW LAB SWAM IN THE CREEK EVERY DAY. I WOULD RECOMMEND THIS HOME TO ANYONE LOOKING FOR A QUIET RELAXING VACATION. YET, IF YOU WANTED, THE QUAINT TOWN OF ST. MICHAEL'S OFFERED NUMEROUS SHOPS AND RESTAURANTS. WE HAD A GREAT TIME! We had a great stay at this property. The house and grounds were exactly as described. My husband and 7 year old twin girls loved the pool and had a blast catching crabs off the dock. We had 2 large crab dinners in the week that we were there! Before arriving I was unaware of the jellyfish in the bay, but my girls thought they were incredibly cool to look at and poke. :) The wi-fi connection worked well and both AT&T and Verizon cell signals were strong. The kitchen had everything that we needed and my children LOVED the tree swing out front. The vacation rental property exceeded my expectations. What a fabulous home and property. Something there for everyone in the family. Excited about renting the property again. The rental agency was easy to deal with and attentive to any concerns that we expressed. All five of us truly enjoyed our stay at the Pines at Barrett Cove. The kitchen was perfect for everyone to be involved in the preparation of our meals. It was great to have the doors open and the incredible view of the water. The grounds were nicely maintained and the wildlife and birds were abundant. The osprey nesting across the cove were fun to watch as well as the blue birds feeding their young in their bird house on the shoreline. Having the two kayaks available for our adult children to use was very enjoyable. The floor plan afforded us privacy as well as great areas for family get gatherings. From the beginning to the end, this was a perfect vacation. The rental company were excellent in handling the transaction. When one property became "unavailable", they found us not one but three to decide on. Great experience for all of us and we'd definitely do it again. We've stayed at this property several times over the last few years, and have always enjoyed our stay. The property is gorgeous, and the location is convenient to the main area of St. Michaels, yet tucked away for privacy. This a our third vaction rental with ESVR. The property was just wonderful. A great spot for the kids to kyak. We had noticed that a guest who stayed proir to us had complained that the grill was unusable. ESVR magically replaced it during our stay, the new grill appeared while we were out. We had a terrific time, great property. We wish we had been walking distance to town. Only issues with property was the lawn really needed to be cut ( it was finally 2 days before we left )and the grill was really not usable.A good vacuum cleaner that could have been used on the rugs would have been appreciated. We would have cleaned a bit more.Also, there was no garbage pick-up during our stay. A great time, we will be back ! We had a wonderful time and loved everything about this lovely home! It was a delight! We enjoyed our stay in this lovely home. Close to town and an easy drive to Easton.Beautiful views from the sunroom. Nice quiet weekend in January. The perfect house for a great vacation! Lovely setting, very comfortable house. Kitchen very well equipped-- was perfect for Thanksgiving. We stayed at Barrett Cove to attend the Waterfowl Festival in Easton. The house and location were perfect. The open concept added to the experience and the kitchen was top of the line. The backyard and dock were great.